I've always really liked Redshrike's Wartotaur concept* (https://opengameart.org/content/tower-defense-prototyping-assets-4-monsters-some-tiles-a-background-image) and felt sad that it never got a full animation for games using LPC assets. With summer approaching, I have been getting back at the game projects I was working on, and decided to give it a go. Now, I'm not particularly good with pixel art or animation, so this is a work in progress. Putting it up in case someone finds it useful and in the hope that others will expand on this as well. I upscaled the forward frame and the side walk in the original; I envisioned this guy as a boss-type monster, so the larger size seemed appropriate. Next to an NPC base sprite, he's enormous. 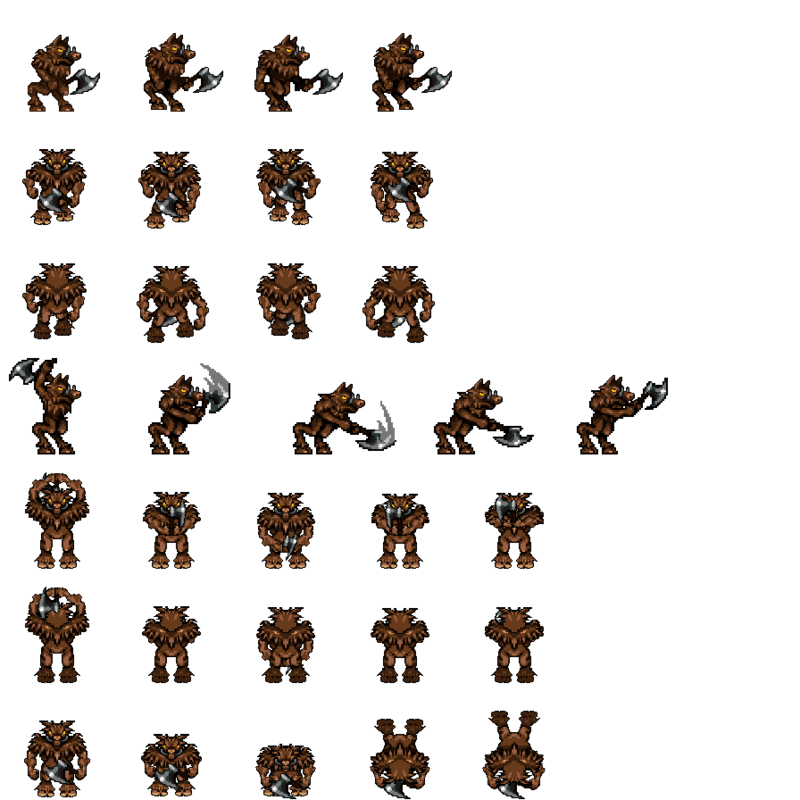 Added a four-frame walk animation for the forward facing sprite, using the Golem as a reference. Recoloured the side-facing frames so their palette matches the forward facing frame. So now he can walk in four directions. I also added attack animations for the N/S facings. I recoloured the original animation so it matches better with the colours in the forward facing (although I think it may be a bit too dark now). I removed the left-facing frames from the uploaded image to keep it compact; they're just mirrored from the right facing ones. All frames are 128 pixels high (4 tiles, in 32 pixel format). Most are also 128 pixels wide, but the side-facing attack frames are 160 pixels wide (5 tiles). Frame 3 & 4 of the N/S frames are just mirrored from frame 1&2. * I think the name "wartotaur" is awesome too, even if the part of my brain that cares about ethymology is quietly rocking in a corner. Credit Stephen Challener (Redshrike) for the concept and initial images of the Wartotaur, and credit OpenGameArt.org for hosting the files. No need to credit me. Just noticed your upload. Funny coincidence! Additional up and down sides would make it really complete, especially a death animation. Looking forward on your progress on this. Updated with attack animations in all four directions (the side facing ones are of course just the originals). I also put back the axe in the movement frames. I recoloured the side facing frames to match the south facing one, although they may be a bit too dark now. I'll probably add an idle animation and I would like to add one or two different attacks. I'm thinking a horizontal slash and some kind of stomp. What this guy needs first though is a death animation. I'll also post my Gimp work file after I clean it up a bit. Updated with death animation (the same type of belly-flop as the LPC assets).